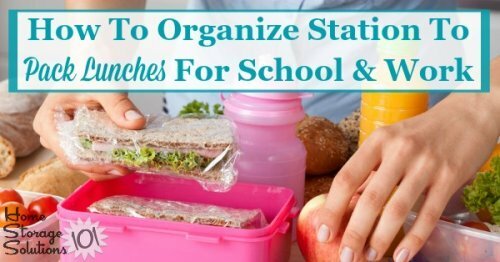 Here is how to create and organize a station in your kitchen to pack lunches for school and work, to make the process easier, more efficient, and less time consuming for your whole family. Back to school time means thinking about packing those school lunches again, and if that makes you groan with dread, or even quiver with fear, then these tips are here to help. Packing lunch, either for school, or for work each day, can seem like a grind, and a thankless task. 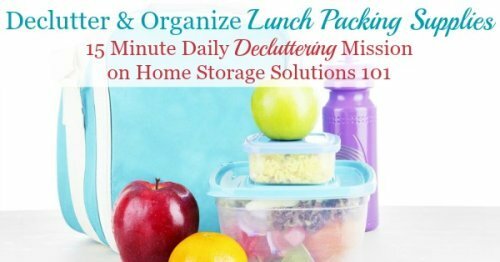 But if you adopt a couple of habits I've listed below, along with creating a "lunch packing station" within your kitchen, then the whole process of making these lunches can get streamlined, and much easier for all involved. 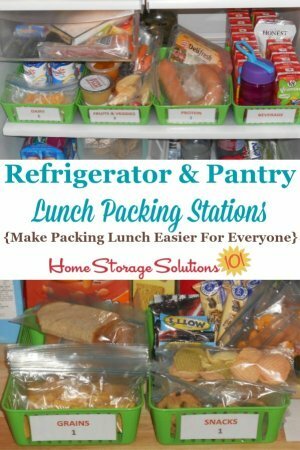 Additional advantages of using this method is that it allows more people to participate in packing lunches each day, so the burden doesn't fall all on one person, and allows for more options and choices, within reason, to those eating the lunches to there's less complaining about what's packed. I've added this organizational task as a daily Declutter 365 mission, scheduled during the week of the Back To School Organization Challenge here on the site, because taking the steps necessary to declutter and organize your lunch packing supplies as school begins will set your whole family off on the right foot for the new school year. Of course, while this article focuses on how this will help you pack school lunches, the habits and methods discussed also work well for those who pack lunches for themselves or partners who go to work each day, not just school. That means this will help both kids and adults! The first step in making the process of packing lunches easier each day is to plan ahead with a lunch meal plan, so you know what you're going to pack for lunches each day for that coming week. You should strive for some variation, so no one gets too bored with what they're provided for lunch, but you don't need to think of something new every single day of the school year. 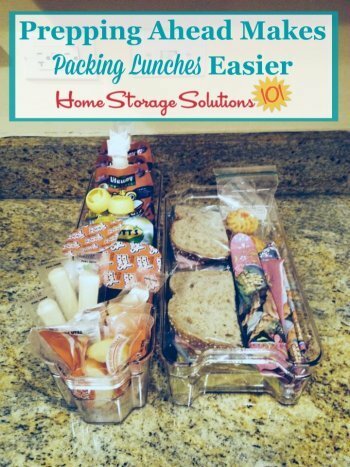 I suggest making a list of easily packable lunch foods that fit into various categories, such as various types of sandwiches, different fruits and veggies, drinks, desserts or treats, etc., that are easily packable and that your family likes, and then just rotate through the lists over and over. That way you don't get stuck in a rut, always buying and then packing the exact same things, but you're not trying to reinvent the wheel either. 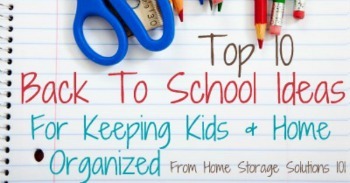 Instead, you can look at these lists each week before going to the grocery, decide what you'll serve for the week within each category, and make sure you stock up on what you need to have for packing the week's lunches. This provides the best of both worlds. It gives everyone some options for what they'll eat that day, so they'll actually enjoy their lunch as opposed to bringing it home uneaten, but it also limits the variety so there aren't arguments or too much dallying while preparing lunch each morning, and it keeps it simple for planning and prepping ahead. After you purchase the food for the week's lunches you'll also want to make time in your weekly schedule (such as on Sunday nights) to prep ahead certain components of these packed lunches. This preparation ahead of time doesn't have to be elaborate. In fact, so you'll actually do it, regularly, I recommend you keep it simple. The steps you take will help you save time later, during the packing process, by getting certain tasks done in batches instead of right before packing the lunches each day. These prep ahead tasks could include washing or cutting produce, and/or dividing and bagging up certain treats or snacks, ahead of time, for example. That's the types of things a reader, Robin, did, in the photo she sent in. Any steps you can do ahead of time to make the packing process easier will save you a lot of time and hassle later. 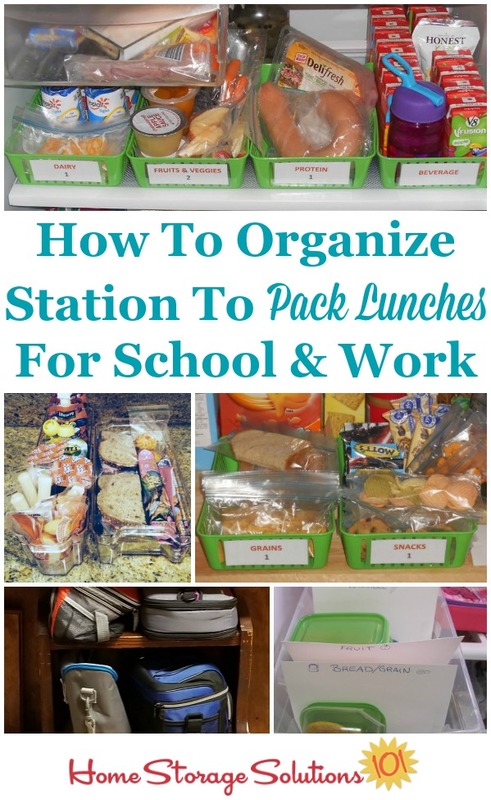 Once you're got the two habits established, of planning lunches ahead of time, and also prepping some of the components of the lunches ahead of time, you're ready to create your lunch packing stations within your kitchen. This requires that you designate a spot in both your refrigerator and pantry where all these items are gathered, so no one is searching for what they've got as choices for lunch each day. 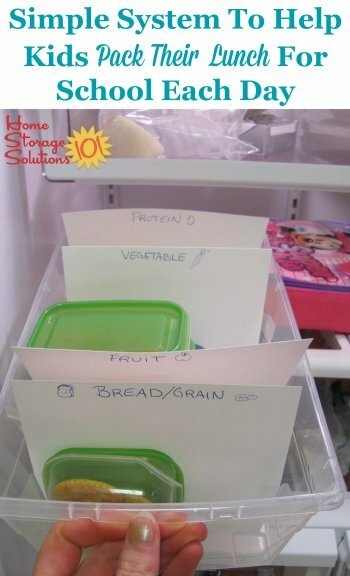 You will need to have one to two bins in your pantry, and another one to two in your refrigerator that hold the items you've decided will be packed in lunches that week. Inside the refrigerator your bins will hold things like ready made sandwiches, baggies of fresh fruit or veggies, cheese sticks, yogurts, or sliced luncheon meat and cheeses they can add to bread to make a sandwich themselves. Inside your pantry bins you will add things like trail mix, nuts, chips, crackers, cookies, and other non-perishable additions or snacks for lunches. You'll also want to include a bin for drink options in the appropriate place, depending on whether the drinks need to be refrigerated, such as for water, milk or juice boxes. You can see a real life example of both the refrigerator and pantry lunch packing stations, as shown in the photos above, sent in by a reader, Jill. As you can see she's prepped ahead and pre-bagged various types of items that everyone can choose from, to put into their lunch box or bag, labeling the various types of foods that each bin contains. She said, "I fill all the baskets on Sunday evening for the week and the kids do all their own packing each day. Itsaves me a LOT of time and hassle in the morning!" In the mornings (or the night before, if that's when your family makes the lunches for the next day) you can pull out the bins on the counter for everyone to grab from, or they can reach into the pantry and refrigerator to grab what they want. But we all know that kids, especially, would choose all desserts or chips, or whatever else they personally love, as their entire lunch if given the chance. So to avoid that problem give guidelines that are posted somewhere near the lunch packing station about what types of items must be packed -- such as a main dish or sandwich, drink, fruit and/or vegetable, dessert, number of snacks, etc. so you are satisfied that they'll pack a reasonably balanced lunch. If you need to you can separate the food from these categories into the various bins and say something like, choose one thing a day from the snack bin, and one piece of fruit from the fruit bin, for example. That's what Jill does with her lunch packing stations. She explained, "I've got baskets in the fridge and the pantry, all labeled with how many of each item the kids need to take for their lunch. This helps with making sure that they are getting a well-balanced lunch and teaches them responsibility because even my 4-year-old can pack her own lunch!" Similarly, Sabrina, another reader who sent in the photo below, does something similar with a bin she placed into her refrigerator, labeled into sections. Sabrina explained, "I really wanted to help my 6yo daughter make her lunches, so I created a bin with everything in it for the week. She was confused as to what to put into her lunchkit, so I made folders and divided the food items into 5 groups - breads, veggies, fruits, protein, and behind the protein is snack/dessert type things. Sundays I get all the food ready and put them in the appropriate spots, and she just takes out one from each section as she chooses and puts them in her lunch kit!" 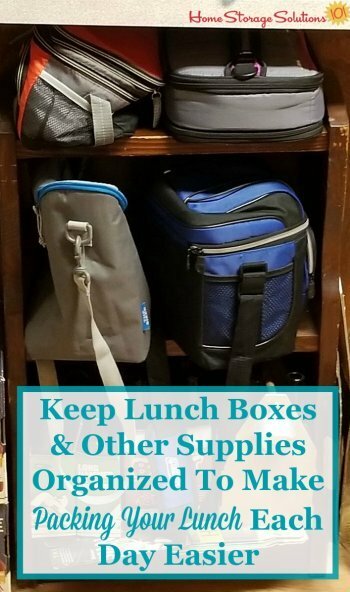 The final step in the process of streamlining the packing of school or work lunches is to organize your lunch boxes and other lunch packing supplies into one area, so everyone knows where to grab the items they'll need to help them pack their lunch for the day. To do this designate a specific place to put food containers, thermoses, napkins, utensils, and lunch bags or boxes within the kitchen, and always put them back there after they're brought home and cleaned, so they're ready for the next use. Here's an example of how one a reader, Debbie, organized her sandwich containers and thermoses, in designated and labeled baskets inside a kitchen cabinet. Debbie said, "After 8 years of having kids in school and needing to pack lunches I finally created this storage area in my home. Each bin / basket is labelled." Similarly, below you can see a photo of how another reader, Sarah, organized her family's lunch bags and boxes, on a small stand alone shelf in her kitchen. When all of the lunch packing supplies have a designated space, and are clean and ready for use each morning, packing lunch using the lunch packing stations in your refrigerator and pantry becomes a much simpler and less stressful process for everyone involved! 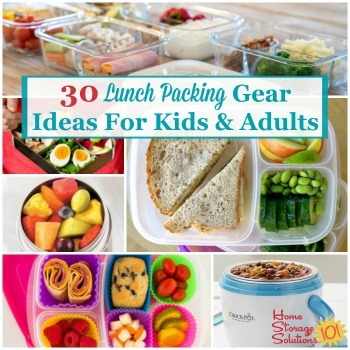 Make sure you also check out this round up of 30 lunch packing supplies and gear, for both kids and adults, to help make it easy for you to pack lunch for everyone in the family each day (referral link). Once at my store scroll down to find this list. I hope these instructions have inspired you to create your own lunch packing station, to make the process of preparing lunches for yourself and your family easier each day. When you begin to declutter and organize your home the feeling you get is contagious, so if you're loving the results you're getting I would encourage you to keep going.